And The Results Are In – What Did The Survey Tell Us? There were 704 responses to the survey in all, and I’ll leave it to you to decide whether the results were of interest or not. It is important to note at this point that answers to this and all questions may be skewed slightly. This is an open blog, and anyone is free to visit and all were free to take part in the survey, however Google Analytics shows that all of the significant volume of new traffic were coming from crochet blogs and crocheting groups on message boards such as Ravelry (more of which, later), so there should be strong representation of the crocheting community present in the results – that is no bad thing at all, but may not be representative of the general balance of those that tend to favour one craft over the other, which brings us on to the next statistic. The survey asked of those people that could both knit and crochet, which craft did they prefer, or find themselves doing most often? 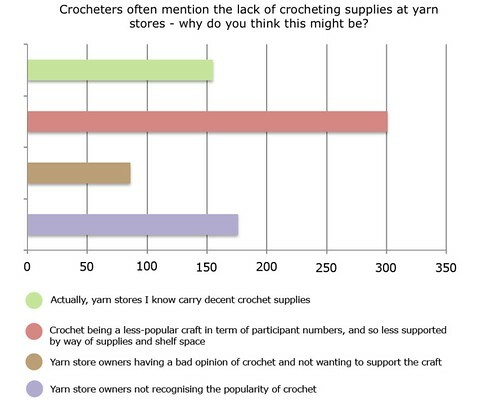 So, though the majority of people that took the survey can both crochet and knit, most claim a preference for one or another craft, with knitting being the most popular. Is this the first hint of an anti-crochet bias, though? 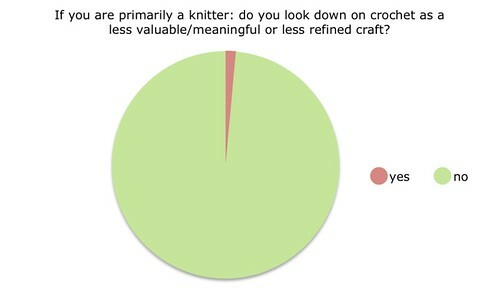 People who professed a preference for knitting were asked if they looked down on crochet as a less valuable/meaningful or less refined craft. 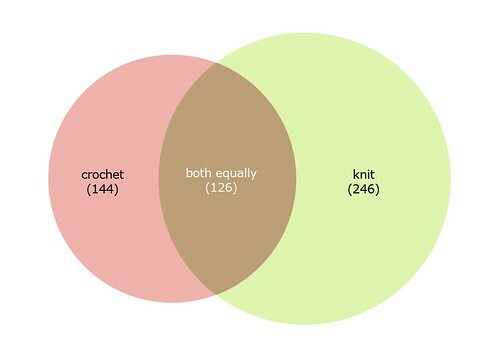 So how many knitters have an anti-crochet bias? 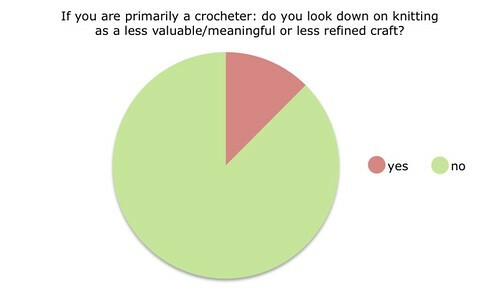 Do this many crocheters really see knitting as a less-refined craft? I admit that I don’t now what to think of this statistic. Could it be that crocheters are just more freely able to admit that they dislike the ‘other’ craft whereas knitters hide their bias, or are the statistics gathered here typical… or are the results an anomaly caused by the depth of feeling and ‘call to arms’ of various crochet blogs. During the time that this survey was running, a number of crochet sites/bloggers/groups picked up on the post and called their members to action to (and here I quote one such post) ‘have our say about the knitting snobs’. Following the new incoming links from my analytics panel showed that all new non-organic traffic was coming from various crochet sources, and I also had a PM on Ravelry the very day that the survey went up to point me towards a group discussing the survey and accompanying post, and all of a sudden I found myself introduced to the members of the Crochet Liberation Front. 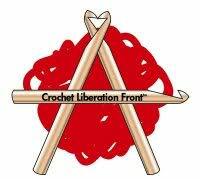 Now, let me just start by saying what a lovely bunch of people make up the vast majority of the Crochet Liberation Front. They welcomed me into their discussion as a guest in their Ravelry Group with grace and interest, and in a way this post is dedicated to the people I chatted with there. 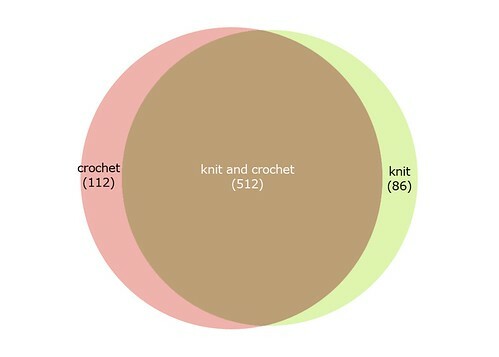 It seems quite clear that many people, especially crocheters, do believe that there is an anti-crochet bias, though how this bias manifests itself seems to be as much a matter of contention as whether it actually exists or not. Many people view the comparative lack of crochet literature and supplies as an anti-crochet bias, whereas others do believe that it is apparent in the very attitude and words of other crafters. I have never experienced this myself, and never seen it happen to a crocheter, but as it was suggested to me on a few occasions maybe I would not ‘notice’ the bias, being primarily a knitter. 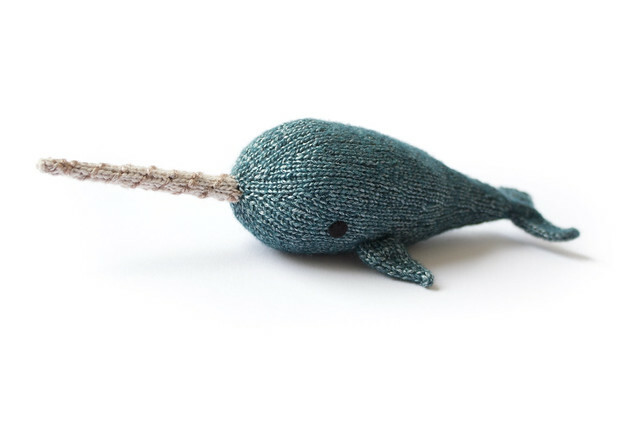 I think it is quite a strange and almost sad idea that one group of crafters feel ill-judged by their crafting cousins, but I wonder if it is in any degree self-propagated? Most of the crocheters I have met discussed with online this last weeks have a live and let live attitude to their crafting, but there were a few blog posts from bloggers that seemed to think that I, as a knitter, needed to be put in my ‘place’, have my attitude adjusting, or thought it necessary to send forth their ranks of readers to show this blogger the power of crochet. That’s fine, and on most occasions quite humorous, but there did appear to be one or two instances where the strength of conviction was a bit too militant for my comfort. I had a couple of instances of name-calling directed towards me, which was a bit much, and various calls to change or delete what I had written, or delete the little cartoon that headed the post which contained the survey. I am glad to say that most people enjoyed the little cartoon I had sketched and didn’t take it out of the humorous context in which it was made, but I will be upfront now and say that this is my blog, and the opinions and ideas expressed here are, of course, my own, and no calls to change what I have written because individuals or groups may disagree will pressurise me into changing what I have written, no matter what names I am called, because this is my little place on the internet. There seem to be such vehement feelings about past-times like knitting and crochet. Surely these hobbies should be full of enjoyment and relaxation, and shouldn’t need to be the subject of such angry feelings? It doesn’t just apply to this debate. 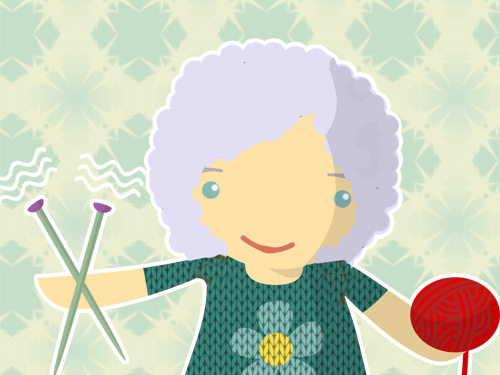 Do I think that young people need to ‘reclaim’ knitting to show that it isn’t the preserve of little grey-haired old ladies? Nope. Do I think that we need to spread the word of ‘Punk Knitting’ and get the message out their and into people’s faces? Nope. Do I think that this knitter needs teaching a lesson? Nope. If you enjoy knitting, or crocheting, do just that. Enjoy it and stop worrying what people think of it. Do you think I am a little grey haired old lady because I knit? Don’t bother answering, because I seriously couldn’t care less if you did.